Today was magic. I woke up in the Netherlands, spent the afternoon at the Orangerie, and night-capped with a spoken word open mic at Le Chat Noir Café. And though I have Thanksgiving and other more obvious things yet to blog--this couldn't wait. 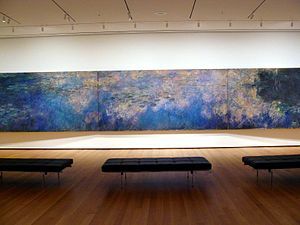 No words or paintings have simultaneously struck me quite like these today- upon seeing Monet's Waterliles for the first time. 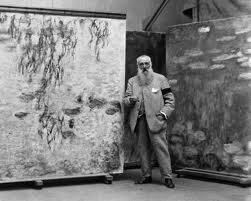 According to the pamphlet at the Orangerie, when Monet donated The Water Lilies to France right after the First World War, Monet wanted to give Parisians a place to "contemplate the infinite" before painted nature (jaw drop #1). In fact, before you walk into the Orangerie's oval rooms where the water lilies are housed, there is an all-white "anti-room" designed by Monet as a "decompression space" between the city life and his work. With out proceeding any further, I was under the impression (ba dum chink?) 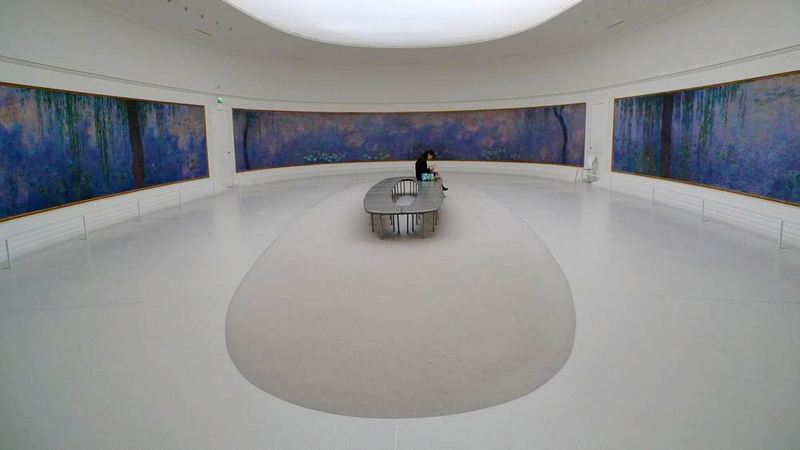 I may have found my favorite Parisian museum. "Les nerfs surmenés par le travail se seraient détendus là, selon l'example reposant de ces eaux stagnantes, et, à qui l'eut habitée, cette pièce aurait offert l'asile d'une méditation paisible au centre d'un aquarium fleuri..."
"Nerves overwrought by work would relax here just like the relaxing example of those stagnant waters, and for whomever inhabited it, this room would offer asylum for peaceful meditation amidst a flowery aquarium..."
The "RELAXING EXAMPLE OF THOSE STAGNANT WATERS." What a mantra guiding me into those rooms (and beyond)! I took in not only the beautiful lilies and trees, but also took note of the beautiful EXAMPLE of the stagnant, reflecting water, providing the inspiration and hope that we too can find similar stillness amongst our ever-changing lives. 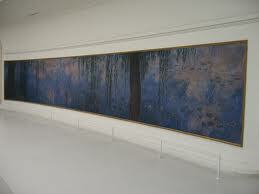 These paintings, on all sides of me (understand just how appropriate the "flowery aquarium" line becomes?) were purposefully painted with out the horizon, and with out formal perspective - and in so doing, gave to me impressions of the infinite. I am so genuinely inspired by what I saw today. If nothing else proves it, it is 2:30am and I couldn't imagine sleeping with out hashing this out. 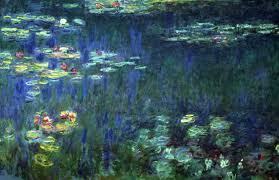 What a genius Monet was, to not only paint something genius, but also to realize his own genius while alive and creating. Through his obvious self-knowledge, his words, and his careful presentation, he made accessible his art to all. 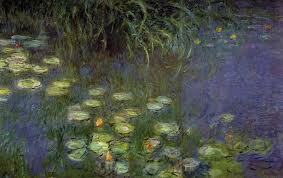 The Water Lilies silently tell an eternal story beautifully shown to millions, and now to me. 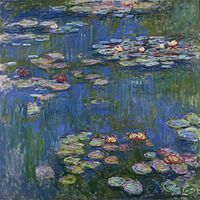 By "example" of that "stagnant water" surrounding the lilies, the perspective, the changing light, and the colorful seasons I have today seen, and thus better understood that which is infinite, eternal, approachable, and peaceful. Moreover, I have taken with me the natural examples of stillness, meditation, and peace. Ye know on earth, and all ye need to know." - John Keats, 1819 "Ode on a Grecian Urn"